High and Dry: A state or condition of being abandoned and stranded, without hope or recovery, like a beached boat. Think Delta frequent flyers out of Memphis…. The Christmas Parade is over, first-semester exams are winding down, and folks are frantically mailing those last gifts to loved ones around the world. All the holiday music programs and special events, including The Nutcracker, are packing our days and nights. Meanwhile, we’re all expected to whip up tantalizing treats to take to the office parties and neighborhood cookie exchanges. Who’s got time? Forget the Martha Stewart approach. It’s time to cut some corners. 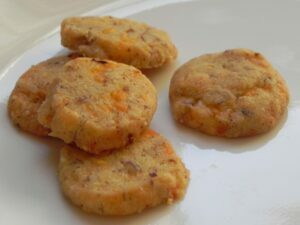 That’s why this week I’m sharing two short-cut cheese wafer recipes and a couple of tasty but EASY cookie recipes that even the kiddies will enjoy making. The cheese wafers REQUIRE chilling, so they can be made up ahead and frozen until needed. The cookies require only a handful of ingredients and are actually fun to make. Sis-in-law Andrea Benfield makes this straightforward wafer version of the traditional Southern cheese straws recipe. Rather than extruding the dough through a cookie press (which ALWAYS breaks about half-way through the production), the baker simply rolls the dough into long ropes and freezes the ropes before slicing and baking. I have found they have more pizzazz if I chop up cans of roasted pecans instead of raw pecans. One 7-ounce can makes up about 2 cups, chopped. Mix softened cheese and butter on medium speed. Work in the flour, salt, and red pepper flakes. Add the nuts and mix well. Divide dough into about 6 equal parts and roll into ropes about 1 to 1-1/2-inch thick. Wrap tightly in waxed paper and foil. Freeze until ready to bake. To bake, preheat oven to 325˚F and line cookie sheets with parchment paper. Remove ropes of dough from freezer and use a sharp knife to slice thin wafers about 1/8-inch thick. Place on cookie sheet about 1-1/2 inch apart. Bake about 12 minutes, until slightly puffed and golden. Remove to rack to cool before sliding wafers onto waxed paper to continue cooling. Store in airtight metal containers. Yields about 2 to 3 dozen. This recipe is another variation of the traditional Southern cheese cookie/cheese straws recipe served at every gathering. It was adapted from the version in the Winston-Salem Junior League cookbook by The Old Bride’s Salem College classmate, Jennie Snead Sheppard. Jennie’s son, Robert, is a 3rd-year law student at Ole Miss. This is the perfect cheese wafer recipe for people who can’t eat nuts. You’ll swear the dried-onion crunch in every bite is from those phantom nuts! Divide dough into six parts and roll into long “ropes” about 1 to 1-1/2 inches in diameter. Wrap each rope tightly in foil. Freeze. When ready to bake, pull out of freezer, unwrap, and slice into 1/4-inch-thick rounds. Preheat oven to 400˚F. Line a cookie sheet with parchment paper and position the rounds about a half-inch apart. Bake about 4 minutes, until golden. Remove tray from oven to rack to cool briefly, and remove wafers to waxed paper to continue cooling. Store in an airtight container. Recipe makes about 4 to 5 dozen wafers. This is a variation of everybody’s favorite peanut butter cookie. 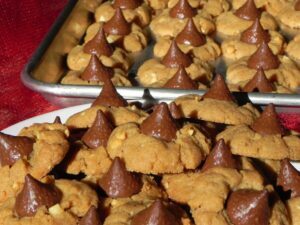 The Old Bride uses crunchy peanut butter and presses Hershey’s Kisses into the tops, a la Blossom cookies. NOTHING is simpler than this recipe. You don’t even have to line or grease the cookie sheet! Preheat oven to 350˚F. Mix all ingredients and roll into one-inch balls. Position balls on cookie sheet about 1-1/2 inches apart. Press one Hershey’s kiss into center of each ball. Bake about 10 minutes, or until lightly browned. (NOTE: Dark metal bakes the cookies faster and darker than light metal.) Remove cookies immediately to waxed paper to cool. Store in airtight metal container (plastic makes the cookies soft). Yields about 5 dozen cookies. VARIATION: Use creamy peanut butter, omit the kisses, and roll the cookies in granulated sugar while still warm. This easy shortbread cookie takes on a whole holiday flavor by topping it with a candied cherry and rolling it in powdered sugar. You’ll want to double or triple the recipe, which is guaranteed to become your favorite holiday cookie. Beat butter and the first confectioner’s sugar on medium speed with mixer until creamy and fluffy. Beat in the vanilla, add the flour, mixing well until dough has formed. Mix in the pecans. Refrigerate dough about an hour. Preheat oven to 325˚F. Line cookie sheets with parchment paper. Place about 2 c confectioner’s sugar in a dish or 8-inch pan. Form one-inch balls from the chilled dough, spacing the cookies on the cookie sheet 1 to 2 inches apart. Press a cherry into the center of each ball, reforming cracked edges. Bake on center rack of oven for about 20 minutes. You’ll know cookies are done when the dough is firm to the touch. Remove to a wire rack to cool for about 10 to 15 minutes. The cookies are fragile, and must cool to luke-warm before handling them. While still warm, carefully place each cookie in confectioner’s sugar, gently scooping sugar over the cookie. Shake off excess and place on waxed paper to continue cooling. Cookies need about 1 to 2 hours to set up. Store in airtight metal containers. YIELD: About 3 dozen cookies. Get you some sugar this holiday season with GIMME SOME SUGAR, DARLIN’, Laurie Triplette’s award-winning family cookbook. From ‘One Old Southern Bride’ to another, give the The Secret Lexicon of Southernness this Christmas.